42 Jamaica Street, Glasgow. G1 4QG.Tel: 0141 248 8581. There has been licensed premises here since 1861. Known as the Clan Vaults Philip MacSorley took over the old premises in 1897 and built a new tenement with a pub on the ground floor on the site of the old pub. The old Clan Vaults was entered from Jamaica Street by a very elegant tiled entrance, under the sign of the Golden Grapes, there was a snuggery on either hand, while in front was a screen to shield those at the bar from the vulgar gaze of the passers-by, on whose painted glass panels was inscribed the words, "Clan Vaults," and pictures of the Camel's Head (Mr Edmiston's trade mark,) which, with design in flowers, fruits &c., formed a very striking feature of the pub. In front of you was not a horse shoe, but a half moon bar fitted with all the most recent modern aids to those in charge, in the way of cork-drawers, pumps, &c.&c. The bar proper, that is, behind those behind the counter, contains barrels of a quaint design with silver hoops, forming, with the bottles and coloured glasses, an effective background. The premises were entirely repainted in 1891, outside and in, and the handsome Japanese paper on the walls gave an air of richness, warmth and comfort. Passing in, on the right hand is the gentlemen's lavatory, light, airy and roomy. While in a sheltered nook a dram and social crack can be had openly at a little round table in the Continental style. Midway in the passage, between the ordinary and first class bars, is the ladies room, specially fitted up for their convenience, an important desideratum too often over-looked. On the opposite side is a large, well-appointed room, called No.2, but pass on, and into, the first-class bar, only stopping to admire the Ann Street entrance. Entering no5 Ann Street, the Clan Vaults was engraved on a marble floor as you go in. This bar like the front bar was a half moon shape, and was one of the most elegantly appointed in the city. The counter was overtopped with white marble, while the walls were enlivened by elegant, mahogany cased plain mirrors. Merely glancing at the handsome plush upholstered furniture also of mahogany, and remarking the fireplace with its painted tiles. Civil young ladies were employed as waitresses. 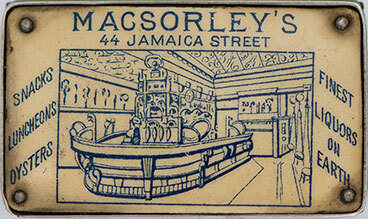 MacSorley's opened in 1899, situated at the corner of Jamaica Street and Ann Street. The interior had a large mahogany oval shaped bar counter with neat little recesses which could hold parties of five or six. At the further end a smaller snack bar and oyster counter had been fitted. Electric lights were installed and a new heating system fitted, the massive cellar was now underground with an extensive kitchen and the new toilets were the most up-to-date in town. In 1904 MacSorley's had a reputation of being the quickest service restaurant in the city. A dining room and grand smoking room was soon added with a room for the ladies as well as an American cocktail bar. All the best drinks were served here including Champagne and MacSorley's special blend of Peacemaker whisky. MacSorley owned other city pubs including Maitland Street, Garngad, the Hampden Vaults, Crossmyloof, Holland Street and Dumbarton Road. Malcolm McIntyre took over after MacSorley in 1910. Mr McIntyre and his father came to Glasgow from Stornoway, where they had carried on a very successful hotel business. On arriving in Glasgow they soon purchased Lauder's Bar, Sauchiehall Street and MacSorley's, Jamaica Street together with another pub at Anderston Cross with Archibald Lauder's wholesale business in West George Street. In 1920 they disposed of the retail business while retaining the wholesale department of Lauder's famous "Royal Northern Cream." Malcolm's sister ran the Royal Station Hotel, Forres. his entire family seemed to be involved with the licensed trade at some time in their lives. Malcolm died in 1932 after a long visit to Canada where he had important interests. Shortly after his arrival in Glasgow he was taken ill and died as a result. During the 1980s the pub was known as Montego Bay. 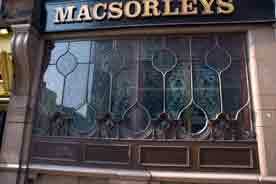 One of the etched glass windows in MacSorley's. 2008. I received an email from MacSorley's Bar on 9 December 2009, the pub has been refurbished and opened again which I'm sure will be a great success as a music venue. On refurbishment the old floor was lifted and the mosaic tiled floor which had been underneath the floorboards for many years. Good Luck in your new venture. CHEERS. Michael Smith is the owner of one of Glasgow's best known live music bars MacSorley's. Good Luck to Mr Michael Smith. If you are one of the few people who have never been in MacSorley's Bar then you are missing out in one of the best live music bars in town. Great Music, live entertainment, and very reasonable prices. MacSorley's tin vesta case (tin matchbox) this box is over one hundred years old. One of Glasgow's most iconic pubs is set to close next month. 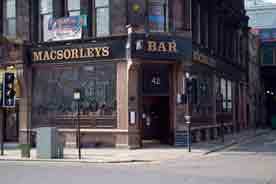 MacSorley's on Jamaica Street has been a local favourite for music lovers for over 100 years! Hopefully someone will take over this premisis as a pub and keep the great history alive. Enjoyed your info on Macsorleys on Jamaica street. I'm not to clued up by whom but... There's live music on a Thursday, Friday, Saturday & Sunday. Including 3 acts on Saturday & Sunday. Jazz on Saturday afternoon - was a trio followed by a big band this Saturday, then s rock band in the evening. Sunday is tribute day, two acts in the afternoon then one in the evening. Full info available on facebook "macsorleys2016"
We at oldglasgowpubs will give MacSorley's a surprise review soon. 1991 Joyce Getty for Tennents. 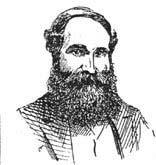 Gray Edmiston one of the owners of the old Clan Vaults, 44 Jamaica Street. Mr Edmiston owned several well known bars in the city including the Lyceum Vaults, 145 Trongate and the Camel's Head Vaults at the Royal Theatre, Cowcaddens. In 1887 Mr Edmiston was at the Licensing Courts, he sought to open his old entrance to the back bar and restaurant, but was refused. Mr Edmiston explained to their honours, some of whom visited the premises, that formerly there were three entrances for the front and back bars, that on the latter he expended some £300 to meet the requirements of a rising business, and satisfy the views of the authorities. When a man fits up the premises at great outlay, lavatories, open fires, comfortable sedans and all the other luxuries. Gregor McGregor hailed from Perthshire he also owned the Clan Vaults. He blended his own whisky on the premises. The traveler could stay in one of the ten well ventilated rooms available.